Data Center Thought Leadership, accumulated by companies or people? DatacenterKnowledge just posted on the Yahoo Factor in data centers referring to Kevin Timmons, Lars Rabbe, Scott Noteboom, and Tom Furlong. But, after spending the past 3 days chatting with the current Data Center Thought Leadership who were at 7x24 Exchange, I think we would have all had a good laugh. Scott Noteboom is not part of this crowd as once you walk into Apple, you disappear from the data center crowd. Kevin Timmons escaped this situation and is now CTO of Cyrus One and was busy meeting and greeting at 7x24. Tom Furlong was circulating after his presentation on the Open Compute Project and Facebook's data centers. Lars Rabbe is busy flying around the world between Estonia, Palo Alto (Skype bldg), and Redmond (Microsoft HQ). So was the data center team that DatacenterKnowledge references assembled by Yahoo or was it assembled by Lars Rabbe? When I was chatting with Lars a month ago, he proudly described his Yahoo data center team and their first data center build referenced in DatacenterKnowledge. Do you think the CEO, and other CxOs selected the data center team? Noooo. 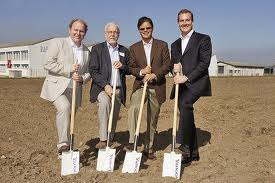 Here is pict of the executive ground breaking, do you think these guys interviewed Kevin, Lars, Scott, or Tom? It is easy to think that companies accumulate talent. But, companies are run by people. People accumulate talent. How much data center talent can Yahoo accumulate now? Not much. Who can accumulate data center talent? You could name the big brands of Google, Facebook, Twitter, Zynga, and Apple. Big brand names bring in the resumes, but the hiring is done by data center managers. The Data Center managers who have thought leadership can outshine others to recruit the top talent. The really good data center staff want to work for a place that will be successful and pushes for the best. Don't you think the companies who can recruit the best are those that have data center thought leadership who can articulate the following? Thought leader is business jargon for an entity that is recognized for having innovative ideas. The term was coined in 1994 by Joel Kurtzman, editor-in-chief of the Booz Allen Hamilton magazine, Strategy & Business. "Thought leader" was used to designate interview subjects for that magazine who had business ideas that merited attention. Also, while Yahoo was building up its data center group, Google was building its team. And, Mike Manos was building up his team at Microsoft. Which brings up another post Mike and I have discussed about the people he accumulated at Microsoft and where all of these people have gone to.